In an article titled "Top Ten Advances In Materials Science",editor Jonathan Wood of Materials Today named carbon fiber reinforced plastics as the 6th most relevant advancement of our times. 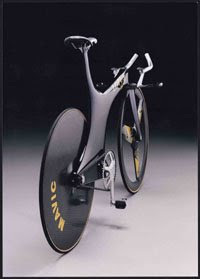 The article throws out a nice picture of the Olympic Lotus bicycle to represent the developments and applications of the material. "The development of carbon fibers, together with advances in design, modeling, and manufacturing, has given rise to composite materials with controlled, specific properties. “Rather than an engineer using a constant set of material characteristics, organic-matrix composites and the associated manufacturing methodology now enables the engineer to design the material for a specific application,” says Richard A. Vaia of the Air Force Research Laboratory. “The manufacturing science has opened up new frontiers, effectively moving component design down to materials design.” The spectacular gain in performance has seen the increasing use of these materials despite the cost and increased difficulty in design, shaping, and recycling, such that the new Boeing 787 uses composites extensively in its wings and fuselage."